Originally scheduled for a fight at UFC 143, many fans were looking forward to a featherweight fight between Erik Koch and Dustin Poirier, two young and talented fighters with boatloads of potential. However, the fight was scrapped due to injuries to both fighters, leaving a ton of fans hoping that they would match up in the future. It looks like that will finally happen, as yesterday both fighters announced on Twitter that they would be fighting each other at UFC 164 on August 31, which takes place where Koch is based out of, in Milwaukee, Wisconsin. 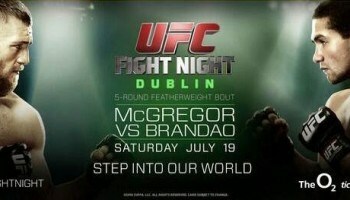 The UFC as of now has not officially confirmed the bout. Currently in the official UFC rankings, Poirier sits at #7 while Koch is three spots below at #10. Koch (13-2) is coming off the first stoppage loss of his career, to Ricardo Lamas at UFC on Fox 6 back in January. Poirier (13-3) also is coming off a loss to Cub Swanson by unanimous decision back at UFC on Fuel TV 7 in February. Both fighters are 24 years of age and still appear to have quite a bit ahead of themselves in their respective careers. On paper this fight looks like it has all the makings of a close, competitive and exciting affair.